“Postman!” corrected my partner, grumbling irritably and pulling the duvet over his head. 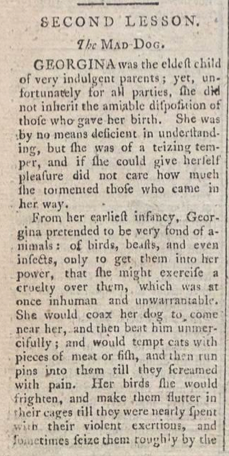 My unusual excitement at being woken by man and beast was because of the anticipated delivery: a volume of the 1815 Lady’s Magazine. 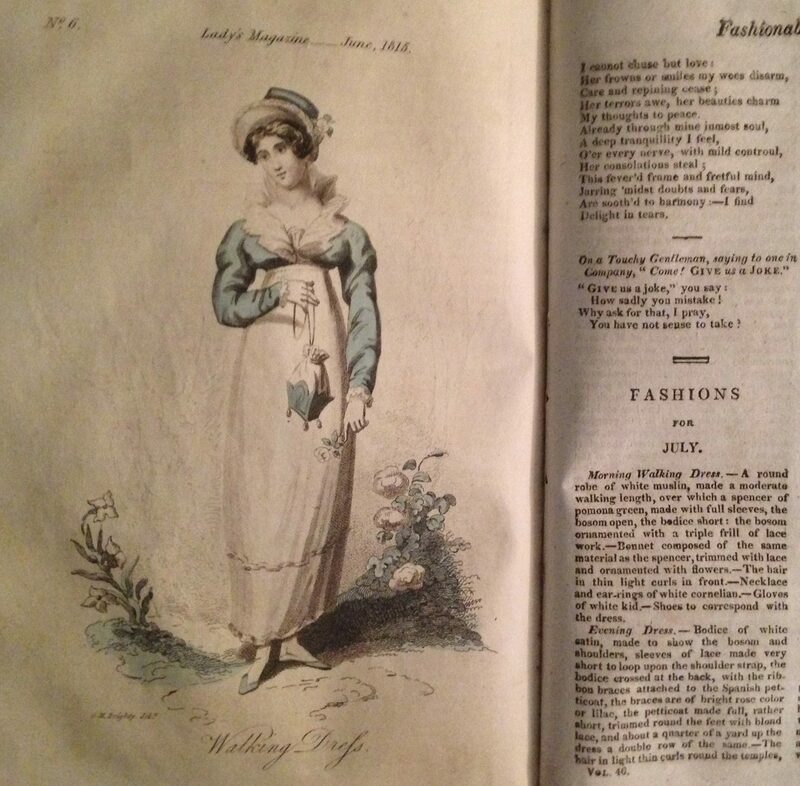 Ever since I bought a 1775 edition of the magazine I’ve been looking for another good deal (which for me means damaged but with as many engravings/plates/patterns as possible) and when 1815 appeared for sale with four fashion plates the opportunity was too good to miss. 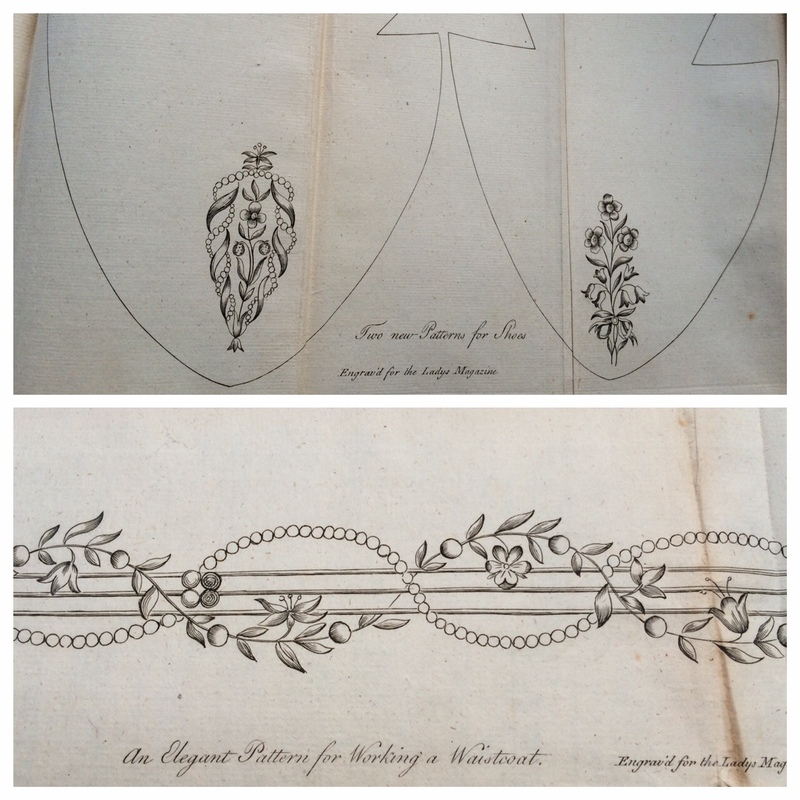 For today’s post I leave off my ‘researcher’ hat and simply share my excitement at my new (old) edition of 1815 and some pictures of the engravings and plates that I’ve edited a bit to show off the really extraordinary skill of the artists. 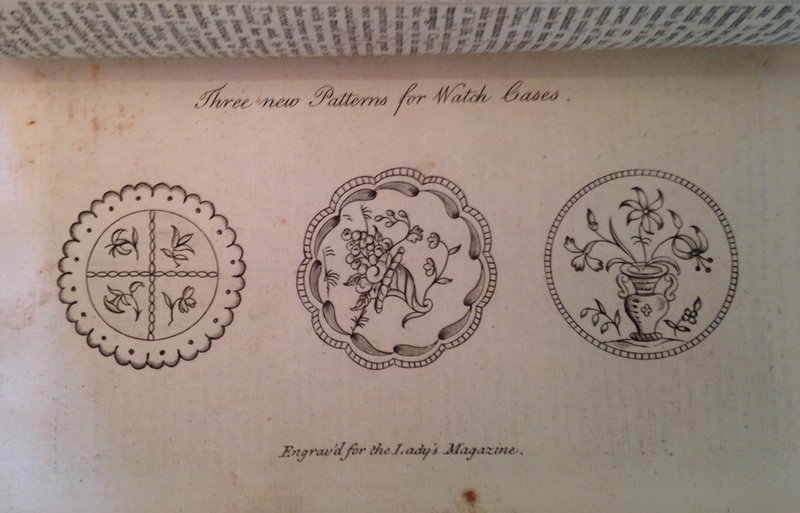 Although the engravings are one of the aspects of the magazine that we know little about (for most of the first series of the periodical they have no artist signatures or printer’s details) they have clearly been carefully chosen by the editors to accompany the tales and, at times, they are commissioned specifically for the stories. One of the reasons the physical copies of the magazine are of such interest to researchers (and especially those who most frequently read the magazine in its digitized form) is of course the possibility of coming across something that is missing from the digitized edition. 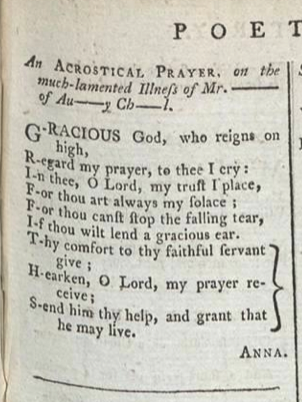 For example, the digitized edition of 1818 lacks several pages, so if you have only been able to access that edition the presence of those missing pages is welcome. Another reason to love the physical magazine is the possibility (that faint hope of treasure that keeps people like myself metal-detecting for hours in the rain) of finding something missing not only from the digitized edition, but likewise missing from most other volumes – such as a pattern unseen for over a hundred years, or an advertisement removed by the binders. And searching for such a possibility, I discovered something rather odd. LM XVLI. Image © Adam Matthew Digital. Not to be reproduced without permission. 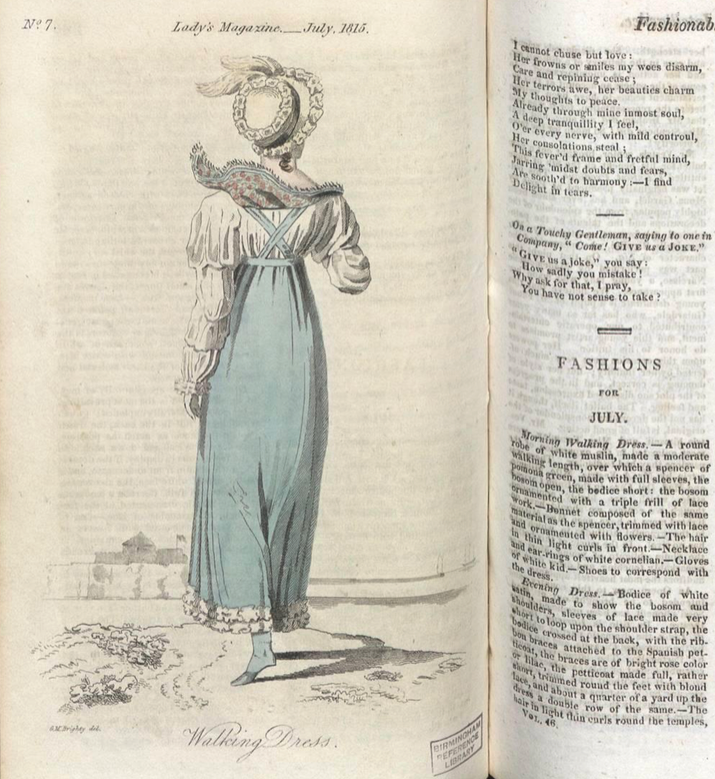 My volume of 1815 does indeed appear to have a fashion plate missing from the digital edition — it is opposite page 285 in my edition and is an engraving of a walking dress described in ‘Fashions for July’. 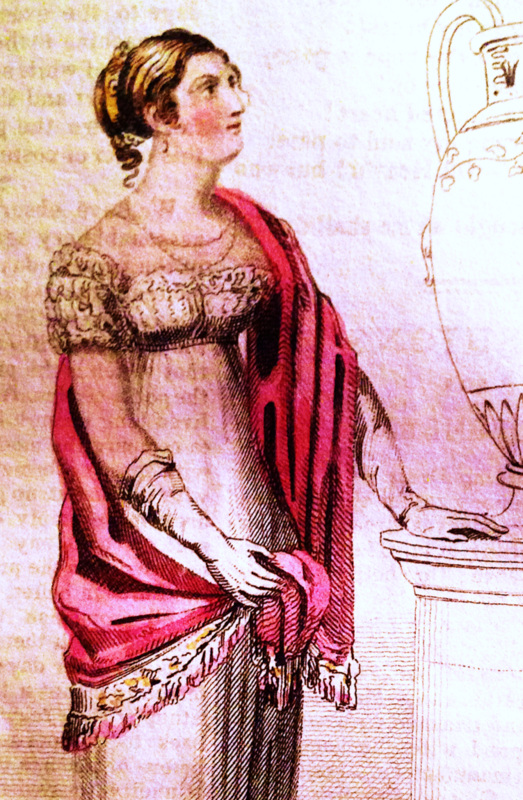 The digitised edition also has an engraving for July depicting a walking dress, but it’s a different engraving. 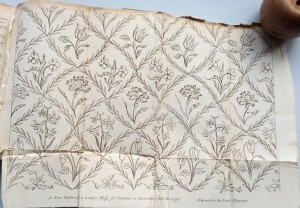 My engraving is numbered 6 in the upper left corner, while the digitised copy’s engraving is numbered 7. Curious indeed! Apparently my binder inserted the June engraving into July while the digitised edition is missing June’s entirely. 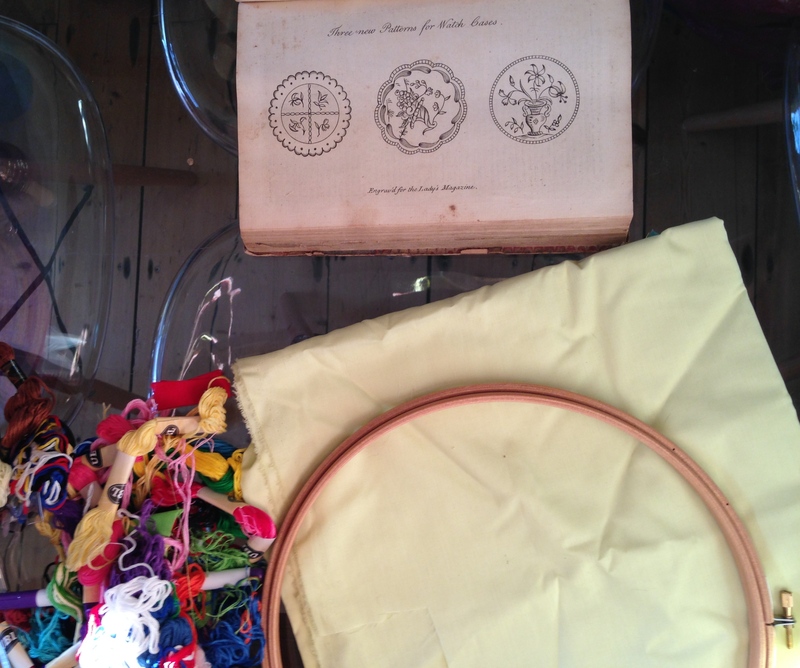 But even when these exciting possibilities fail to materialise, the material of the magazine is fascinating enough in its own right. I’ve written before about the differences between working with physical and digital editions: I love the ease of the digitized magazine for work, for speed, for accessibility, for being able to drink a cup of coffee without fear of destroying something priceless, and so on. 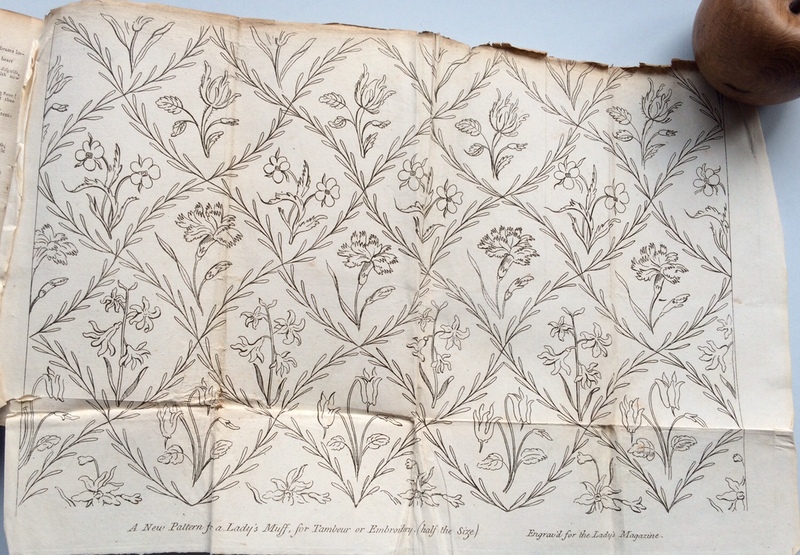 Yet the beauty of the fashion plates and engravings is undeniably enhanced by seeing them close up in person when the detail of the engravings, the strokes of the etchings, the brightness of the colours appear as if they were printed yesterday, not 200 years ago. 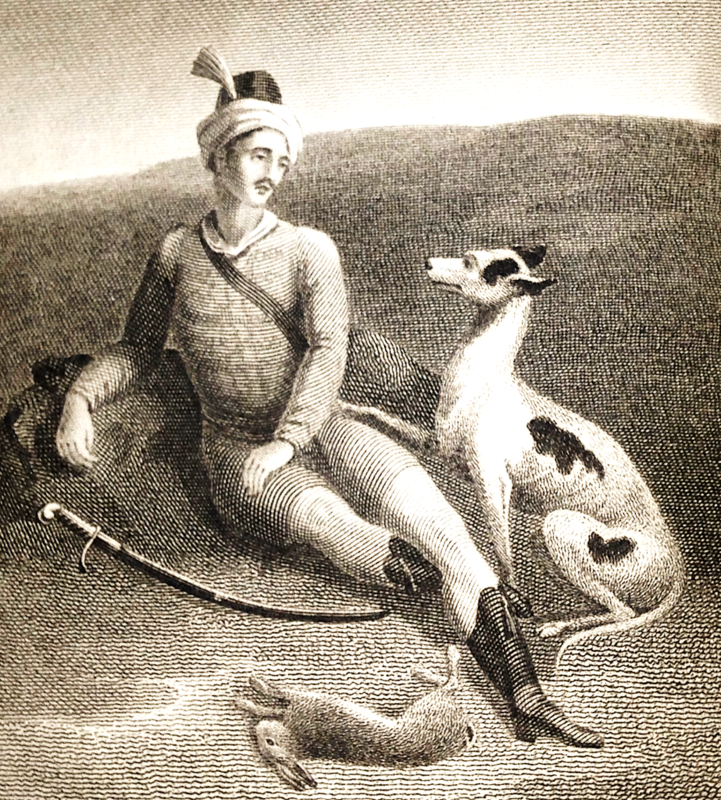 1815 was an especially rich year for engravings; it includes several portraits of famous eighteenth- and nineteenth-century personages, including Byron, Lucien Bonaparte, Lord Castlereagh, Amelia Opie and others. 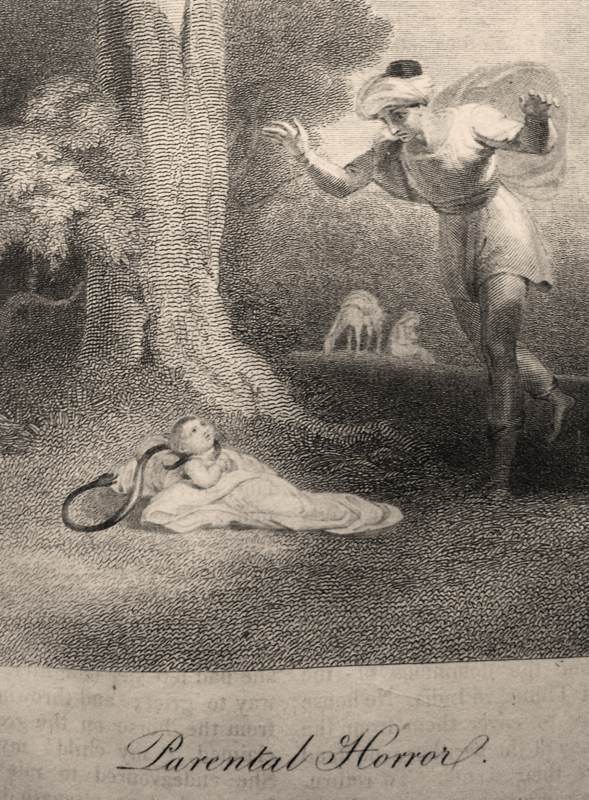 The illustrations to the fictional content are likewise particularly intriguing; ‘Parental Horror’ depicts a father witness a snake coil around his infant’s neck while ‘The Charm of Modesty’ shows the youth Lycophron discern his lover Aglaia from a group of women enchanted to appear identical to her only by virtue of her downcast, modest eye. The engravings present an opportunity to learn more about the printing process and editorial decisions behind the scenes of the finished product, yet at the moment they remain frustratingly silent. Where did they appear first, who selected them for use in the magazine, who printed them and who wrote the stories for which they were commissioned? 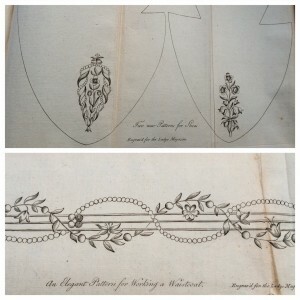 Hopefully as we proceed with our work on the project and uncover more about the mysterious editors and publishers behind the magazine we will learn more about the illustrations and plates that were a constant feature and important selling point throughout the over 62 year print run of the Lady’s Magazine. But for now, enjoy the pictures. This entry was posted in Uncategorized on July 14, 2016 by jd359. Yet once the difficult decisions are made, how can we disseminate a database with tens of thousands of items, belonging to dozens of distinct genres, into readily comprehensible information? 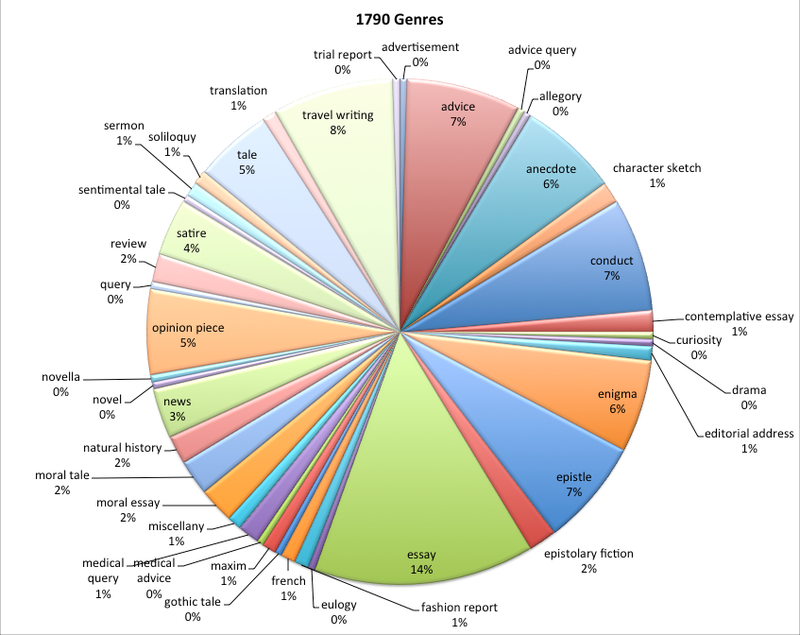 The pie chart is a simple yet effective research tool that allows the different genres in the Lady’s Magazine to be visualized. 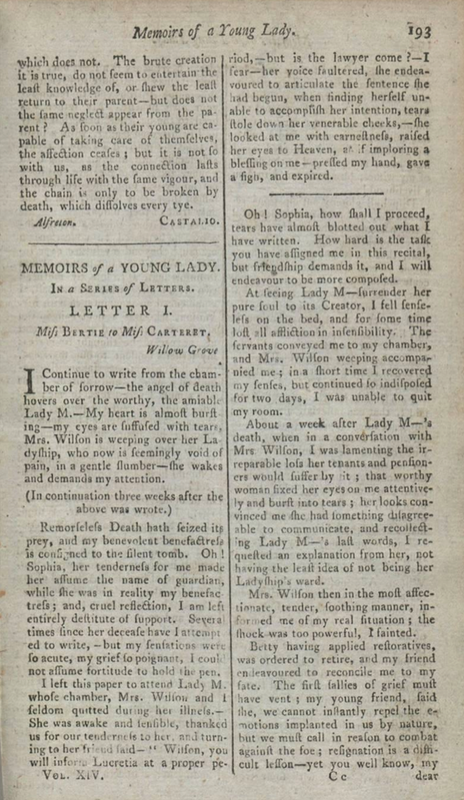 In 1770-71, for example, the magazine was largely made up of anecdotes, essays and translations, followed by enigmas and conduct items. 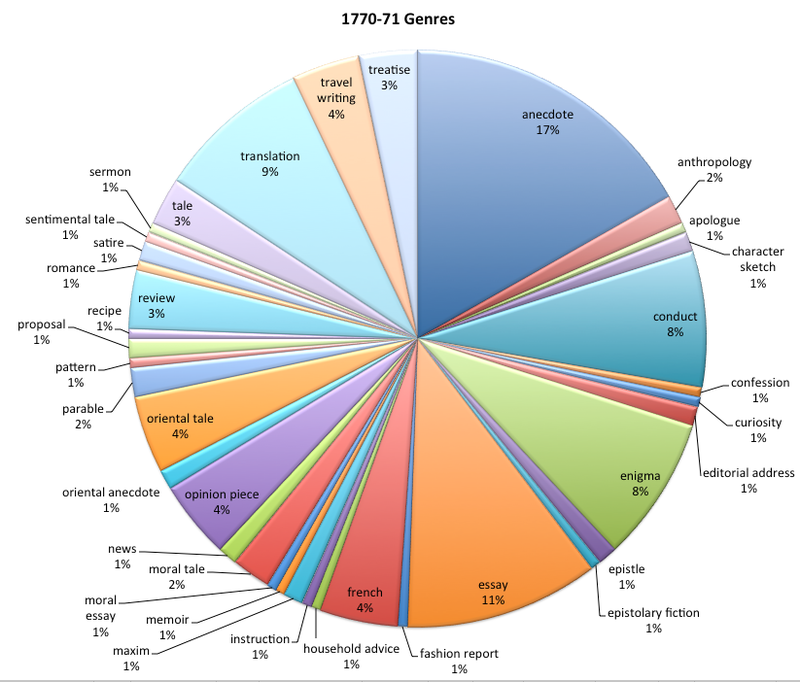 In comparison, in this sample chart for 1771, it is easy to see that the majority of the magazine’s items are now essays or moral essays, followed by enigmas, translations and reviews. And of course, because enigmas are short in comparison to the lengthier essays, translations and reviews, it is these latter three genres that made up the bulk of the magazine’s content in its second year of publication. 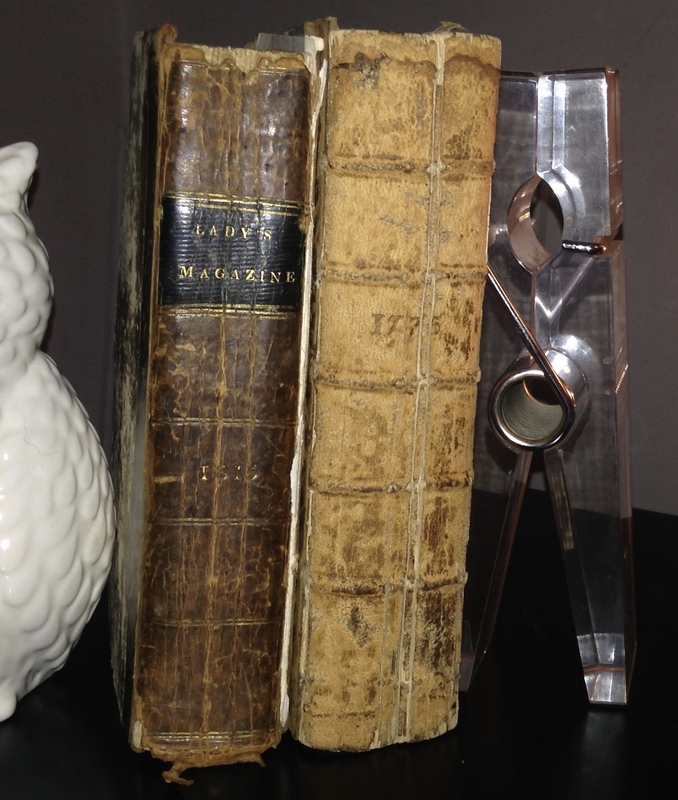 Anecdotes in 1771 make up only 5% of the magazine, in comparison to 17% the previous year. One of the key aspects of my research on the project is not only to analyse the items in order to assign them genres, but also to examine how the magazine’s generic composition evolves over the five decades of shifting literary tastes and political, social and cultural revolutions of its first series. Although this is a difficult task to negotiate, by breaking down the magazine’s generic makeup for each year in a pie chart, one can readily see what types of items could be found in the magazine. From here, it is easier to extrapolate the larger shifts in genres over the magazine’s print run. The dramatic decrease in the number of anecdotes from the first to second year, for example, could be explained by the magazine’s increasing readership and correspondingly larger number of contributors of original essays and fiction that meant the editors could rely less on extracted and popular anecdotes as material. 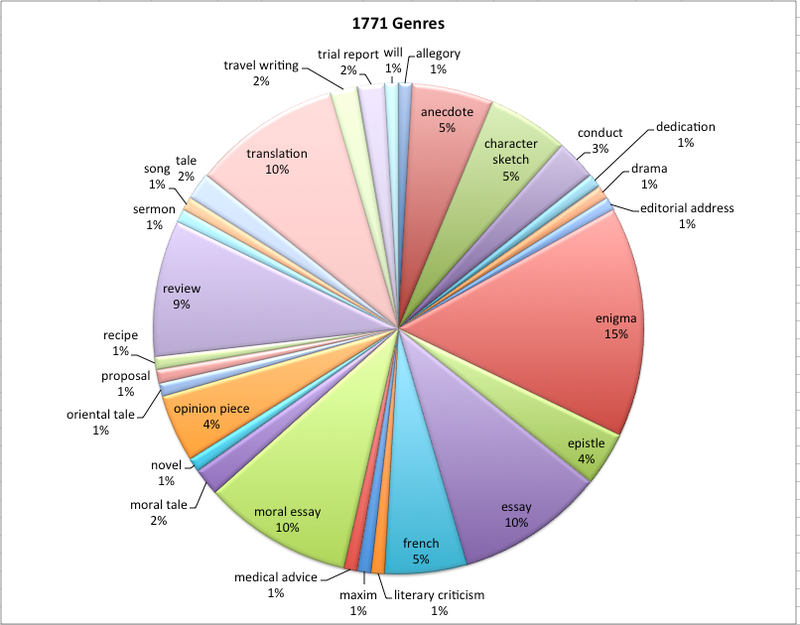 The most striking aspect of the pie chart created for 1790 is, I believe, the greater number of distinct genres in the magazine. 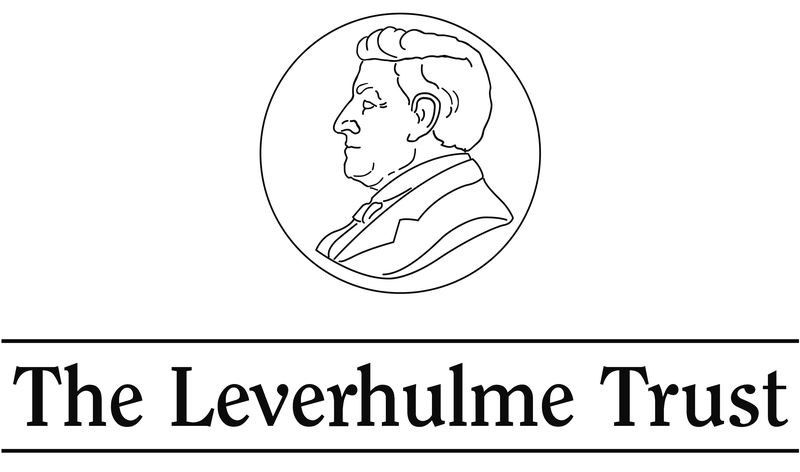 Twenty years into its publication, the periodical was clearly comfortable with its position in the literary marketplace and the editors and publishers felt secure enough to print an even greater variety of genres and items. Also interesting is that, in the key historical moment, the number of translations (usually from the French) has dwindled to only 1% of the magazine. This is only a snapshot of one aspect of our research on the magazine’s composition and genres, but it allows the scope and quantity of data on genres to be readily perceived and is useful in analyzing the evolutions and in disseminating the results to other researchers and the public. This entry was posted in Uncategorized on April 27, 2016 by jd359. 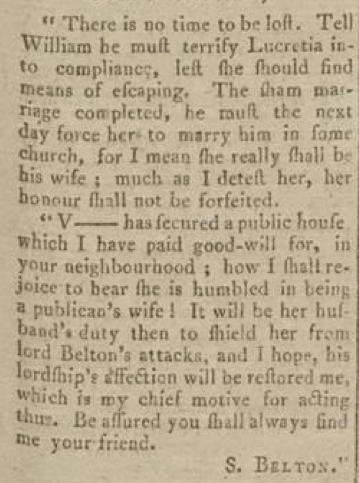 LM XLIII (December 1812). Image © Adam Matthew Digital / Birmingham Central Library. 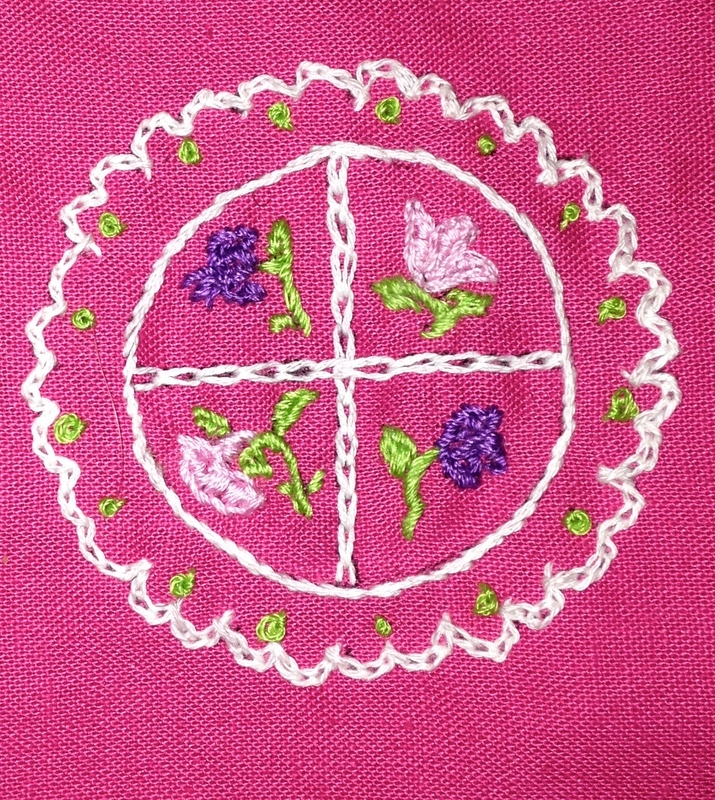 Not to be reproduced without permission. 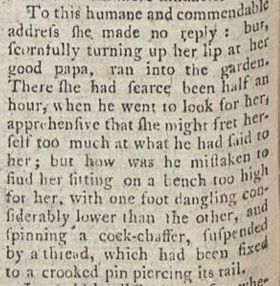 Drama appears in the Lady’s Magazine throughout its over sixty year print run in numerous forms. 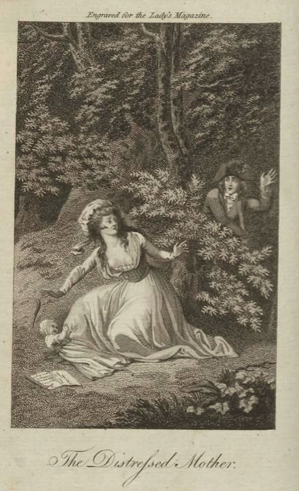 The most frequent genre is the review, but the theatrical world is also presented to the magazine’s readers through, for example, biographical essays on actors and actresses, excerpts from plays, songs from new productions, engravings of theatres and performers and translations of (primarily) German and French dramas. LM I (December 1770): 227. Image © Adam Matthew Digital / Birmingham Central Library. Not to be reproduced without permission. 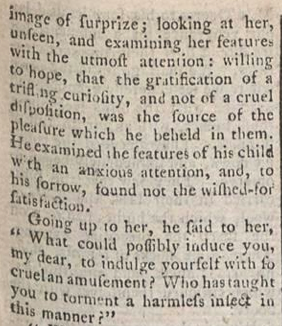 From its commencement in 1770 the magazine demonstrates its engagement with the contemporary theatrical milieu – in December 1770 a contributor who signs himself Theatricus offers an essay including anecdotes about morally jeopardized individuals who repent after seeing plays in which their weakness (such as gaming) are exposed. 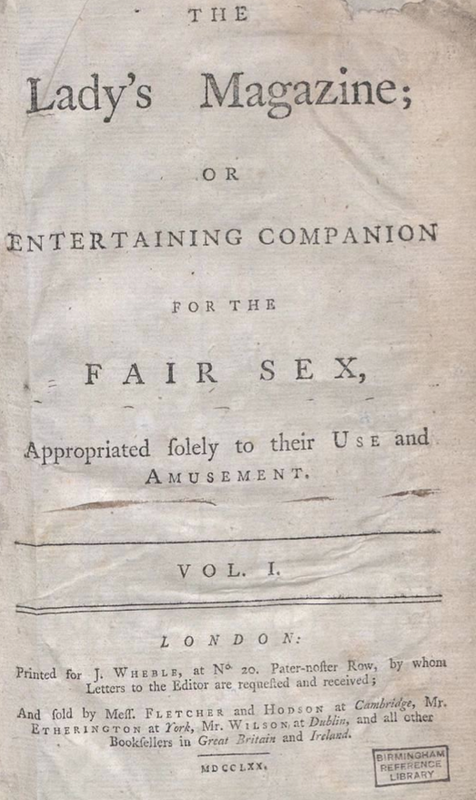 ‘The Remarkable Effects of Theatrical Representations’ functions as a conduct work, opinion piece, and tract on morality but also blatantly promotes English theatre and ‘the great utility of Theatrical amusements’ (LM I [December 1770]: 227). 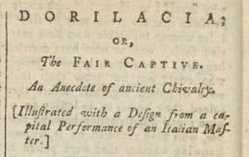 The piece mentions some of these useful plays – The Provoked Husband and George Barnwell – and concludes with the hope that ‘our nobility would raise the same subscription, and appropriate the same house that they now use for Italian operas, to a good set of English actors’ (LM I [December 1770]: 227). The first year of the magazine also includes a range of reviews of plays such as Clementina, a tragedy, and the Madman, a burletta. 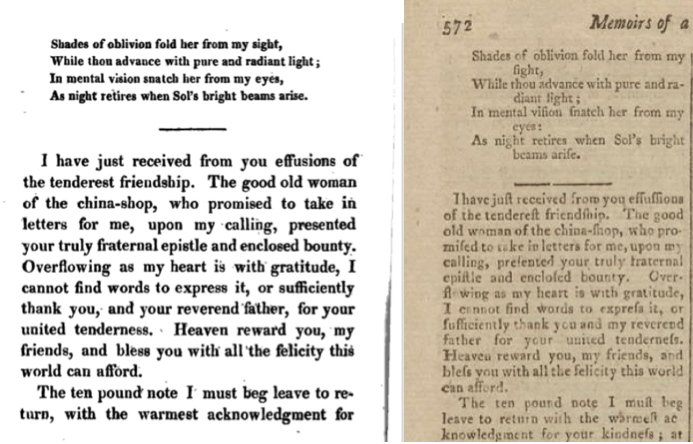 Reviews (or ‘accounts of’ different plays as they are described in the periodical) appear dispersed throughout the other items in each monthly installment, which usually includes 1-4 such reviews. 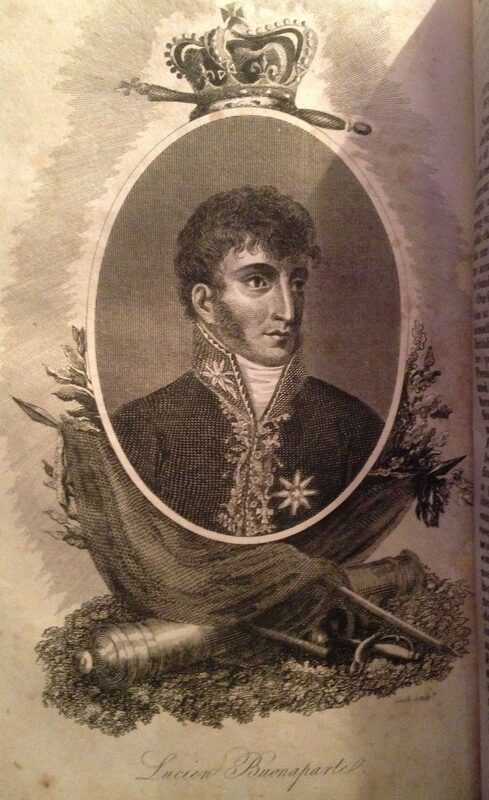 LM XLIV (Supplement 1813). 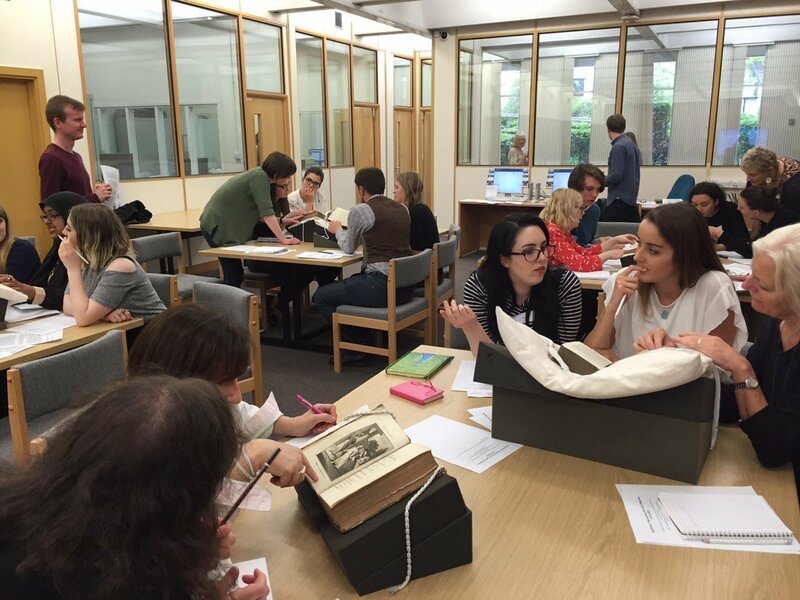 Image © Adam Matthew Digital / Birmingham Central Library. 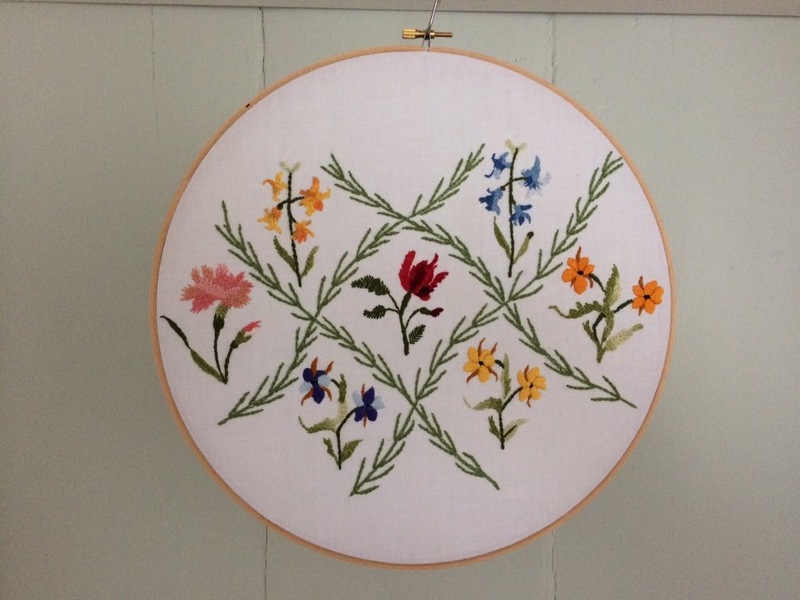 Not to be reproduced without permission. 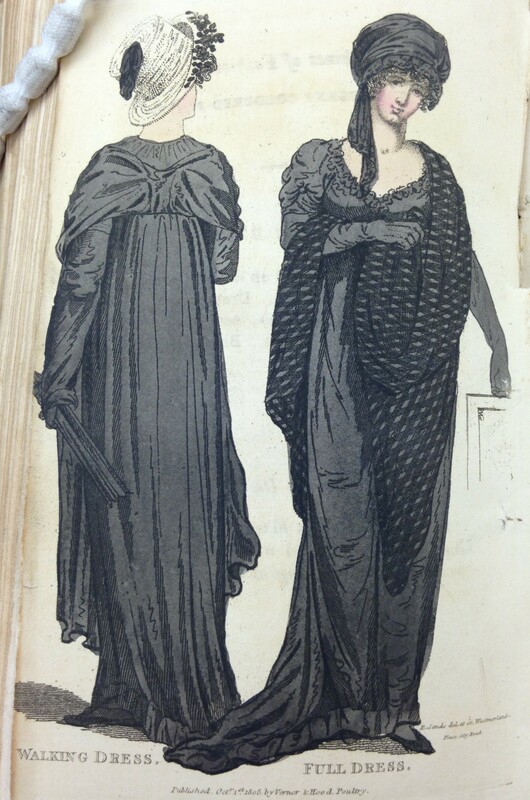 While the reviews remain a standard feature of the periodical, preliminary research indicates that there is a sharp decline in their appearance from 1811-1813. Indeed, during this three year span any mention of theatre is scarce. 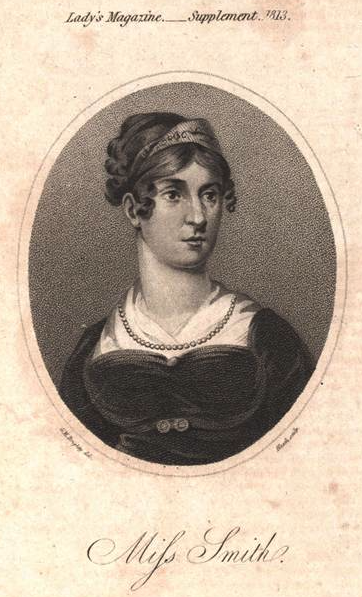 Exceptions to the paucity of theatrical material include biographical sketches of Sarah Siddons in 1812 and in the 1813 supplement an account of Miss Smith (Sarah Bartley). 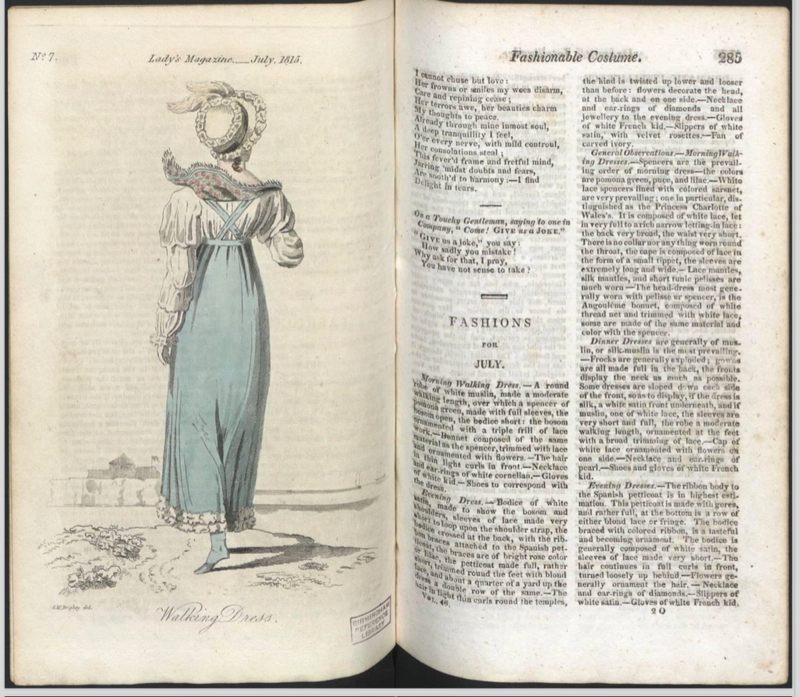 In 1814 the reviews are consolidated into a single section called ‘Dramatic Intelligence’ which is subdivided into sections by the individual theatre. After this the periodical undergoes another refashioning and from 1818 reviews are located under the section entitled simply ‘Drama’. 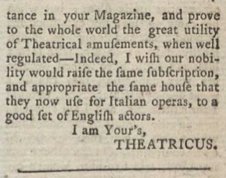 In the early years of the magazine the theatrical reviews were primarily synoptic, including details of the performers and either extracts from the play or summaries of the plots, and offering little criticism. 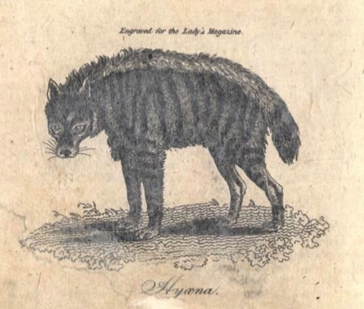 For example, the January 1771 reviews of Almida and the West-Indian detail the location, actors and actresses and parts alongside lengthy descriptions of the plays and describe the audience reception. 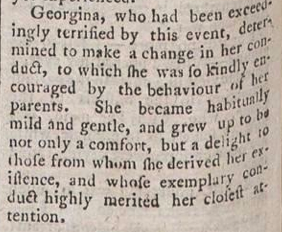 This is a fairly standard formula for the majority of the reviews throughout the lifetime of the magazine, but in the early 1780s some of the reviews do begin to include more critical examinations of the plays’ content. Such more critical reviews run alongside the conventional summary model for the duration of the periodical. 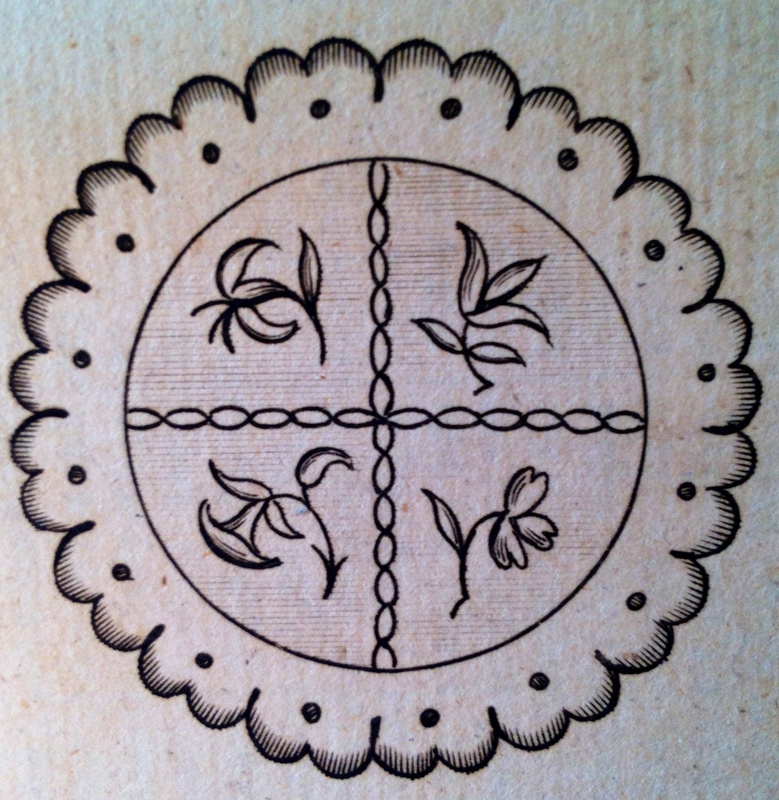 LM XII (June 1781): 321. 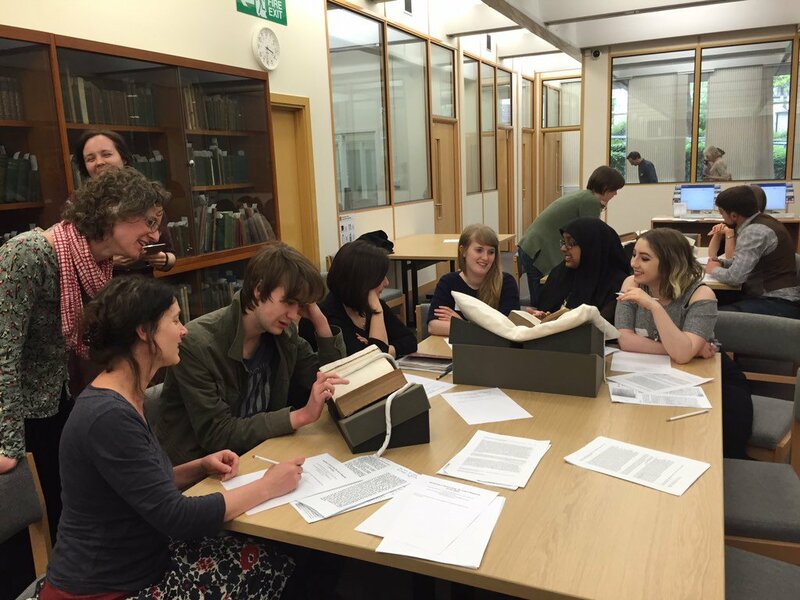 Image © Adam Matthew Digital / Birmingham Central Library. 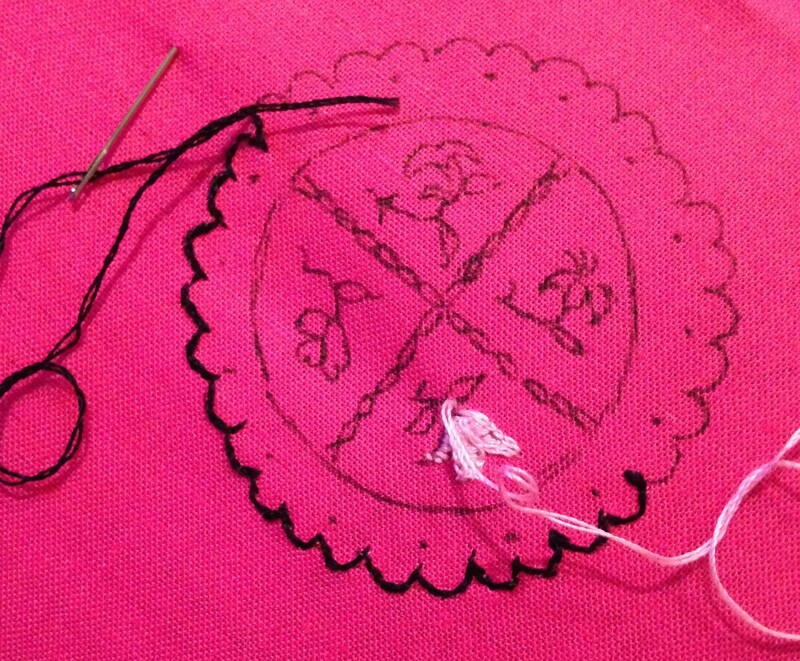 Not to be reproduced without permission. 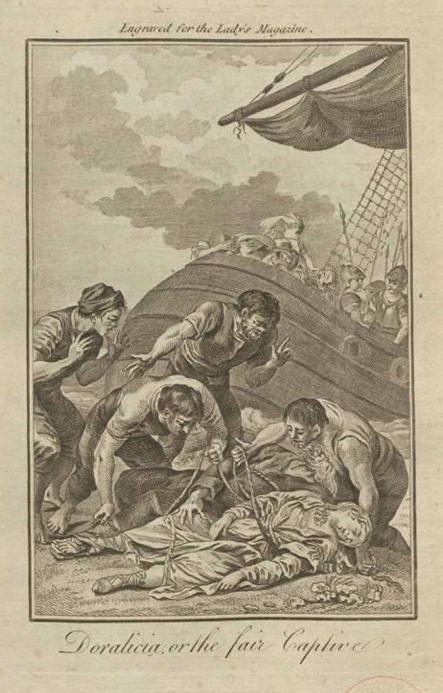 The account of the Dead Alive, a farce, in June 1781, is one of the first that alters the traditional model of reviews. This ‘account’ does so by introducing the critical commentary in the form of a very lengthy footnote. This style is not a common one; although reviews do occasionally appear with commentary provided in the footnotes, more often the reviews embed the criticism within the body of the article. But in the account of the Dead Alive the unsigned writer opens with ‘The piece*’ and then includes her opinion in the subscript marked by the *. 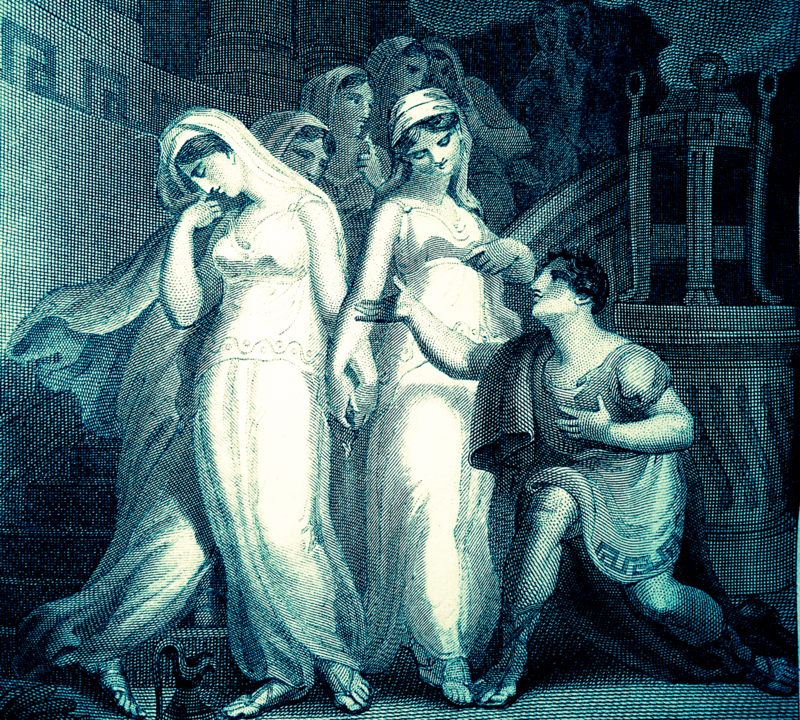 The body of the account continues with the traditional summary of the play’s plot. 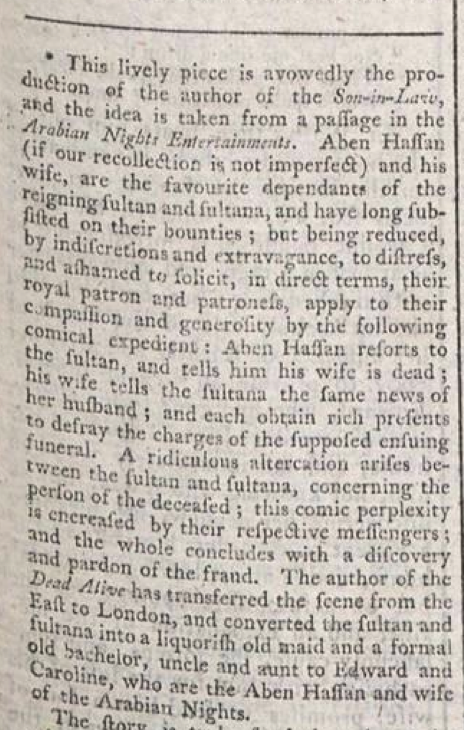 The writer states in the opinion subsection that the play, taken from a passage in the Arabian Nights Entertainment, has been ‘transferred’ by the playwright from ‘the East to London, and converted the sultan and sultana into a liquorish old maid and a formal old bachelor’ (LM XII [June 1781]: 321). 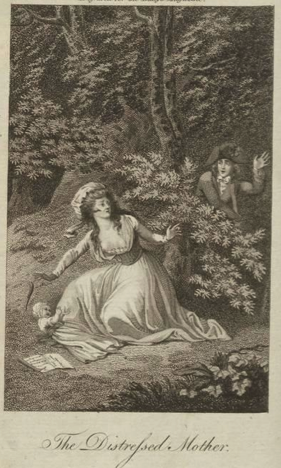 Arguing that the play is ‘avowedly the production of the author of the Son-in-Law’ the contributor notes that the play is ‘enlivened with that peculiar vein of humour, those droll equivoques, and odd turns, that distinguish the author of The Son-in-Law’ (LM XII [June 1781]: 321). 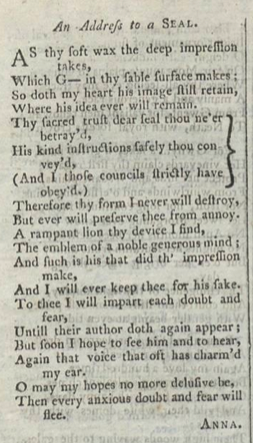 The anonymous writer also comments on the originality of the characters, pointing out that the character of Motley, ‘though touched by a more masterly hand in The Apprentice, and more recently displayed in All the World’s a Stage, still derives some originality from the author’s management of it’ (LM XII [June 1781]: 321). Complimenting the performances of the company, the acting ability of particularly Mr. Edwin, who played Motley, is described as excellent. The body of the review, after summarizing the plot, provides some of the songs. 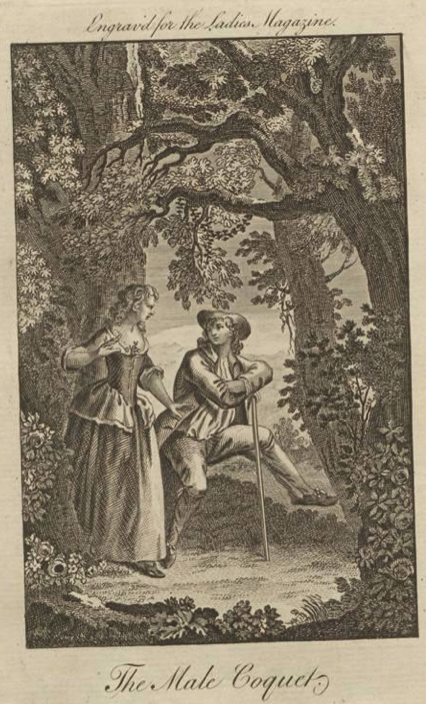 Another review that makes use of footnotes or subscript for the critical content is the serial feature on the ‘Spendthrift, compared with The Generous Imposter’ from the French of Des Touches. This review is particularly interesting because it is the first I found that offers a sustained and serial critique of the effectiveness of the translation, rather than the play itself. 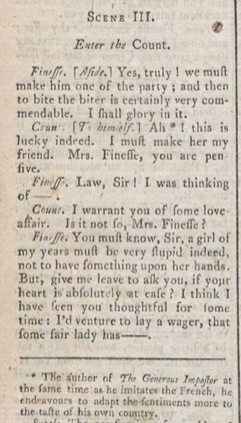 Although not all of the installments include lengthy discourse comparing the translation to the original, there are many that do, and such passages focus particularly on the ability of the author to convey to and/or modify for an English audience the sentiment and humour of the French original. Other genres, such as the essay, provide biographies of celebrated actors and actresses, often extracted from memoirs or autobiographies. 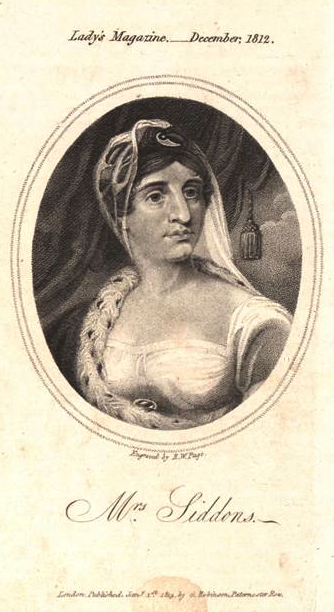 Especially in later years these essays are accompanied by engravings of the individual, such as Sarah Siddons, one of the more celebrated actresses of the eighteenth century. 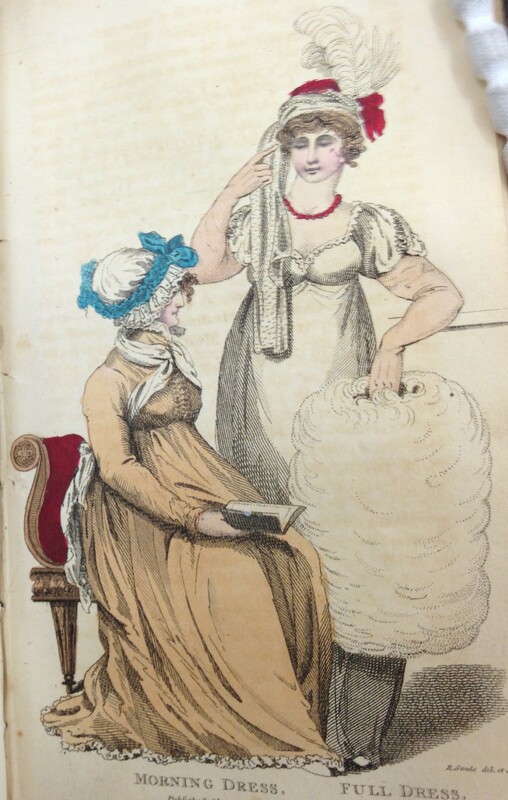 Mrs Siddons’ enduring popularity is demonstrated by her appearance in the magazine in various genres including theatrical reviews, engravings, and as the subject of poetic odes from (at least) the 1780s through the 1820s. 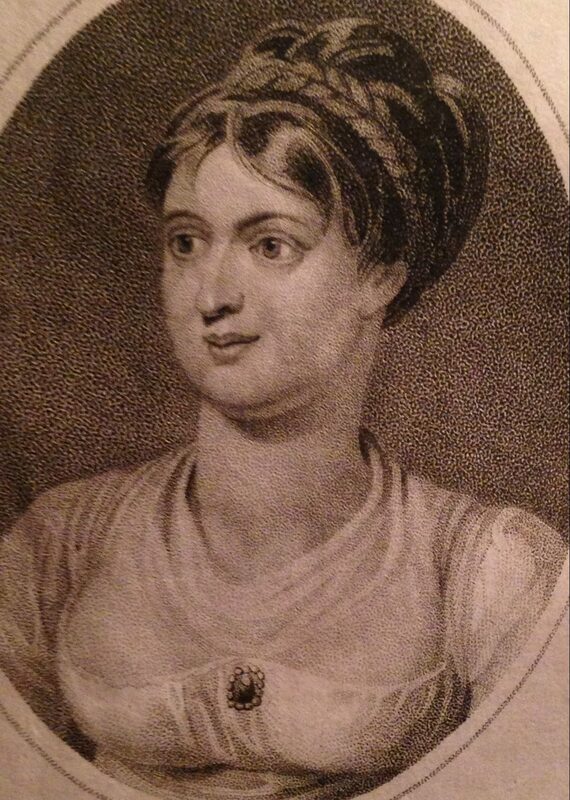 Other actresses and playwrights appearing in engravings include Hannah Cowley and Dorothea Jordan. 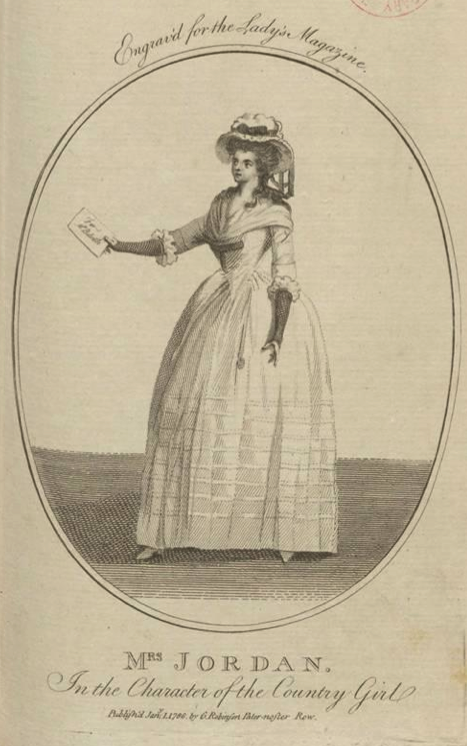 The enduring prevalence and shifts in the material concerned with the theatre within the Lady’s Magazine offers fascinating insights and information on both the reception of plays and translations but also the changing sociopolitical contexts in which productions were staged and received. The range of genres that make use of dramatic pieces, language, and influences for a range of purposes reflects the engagement of readers and contributors with the contemporaneous theatrical world. Although this preliminary research raises more questions than it answers at this stage, it provides an important glimpse at the shifts in both the types of genres (essays, reviews, opinion pieces, etc.) that engage with a popular and constant topic within the periodical, and the shifts within a specific genre, such as the review. This entry was posted in Uncategorized on November 9, 2015 by jd359.